The ESV Value Compact Bible retains many of the components of the ESV Compact Bible. It features a quality TruTone cover, but is made more affordable by not including gilded paper edges or a ribbon marker. The Value Compact Bible is a conveniently sized and affordably priced edition, making it a practical option for anyone who wants to take God's Word wherever they go. ESV Value Compact Bible (TruTone, Midnight, Flame Design) by English Standard was published by Crossway in June 2018 and is our 5879th best seller. The ISBN for ESV Value Compact Bible (TruTone, Midnight, Flame Design) is 9781433560835. 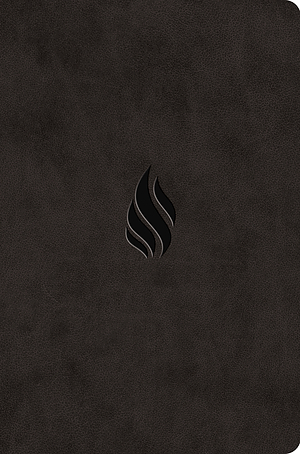 Be the first to review ESV Value Compact Bible (TruTone, Midnight, Flame Design)! Got a question? No problem! Just click here to ask us about ESV Value Compact Bible (TruTone, Midnight, Flame Design). A:This Bible measures at 152x100mm. Thank you for using the Q&A Forum.